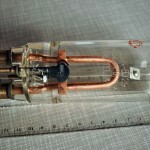 5J29 is a split anode magnetron. 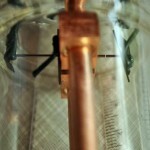 This device is water cooled, the water flowing round the metal loop. Description: External magnet, split-anode, glass body CW magnetron; 350 to 770MHz; 75 to 150W out. 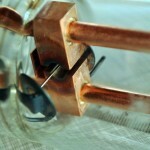 Liquid-cooled through the anode tubular pins and the internal loop, part of the tuning line resonator. 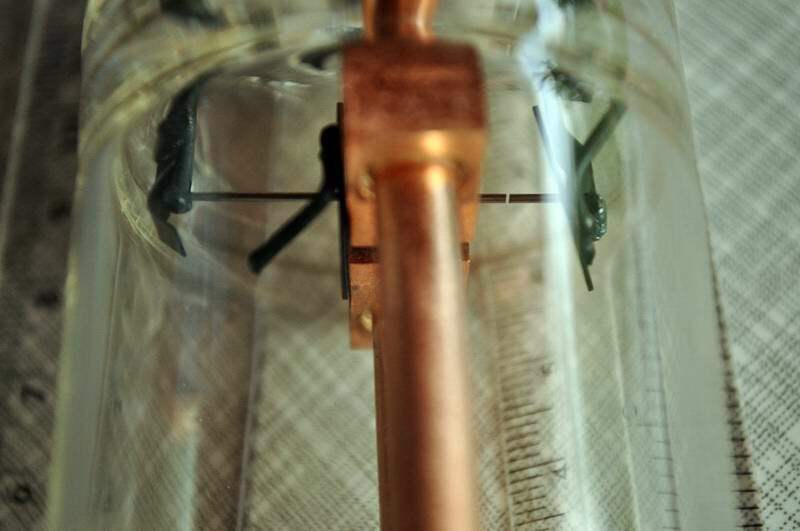 450mA max at 2500V, 1500 gauss flux density. Used in the AN/APT-4 jammer. ‘Confidential’ etched on the glass. 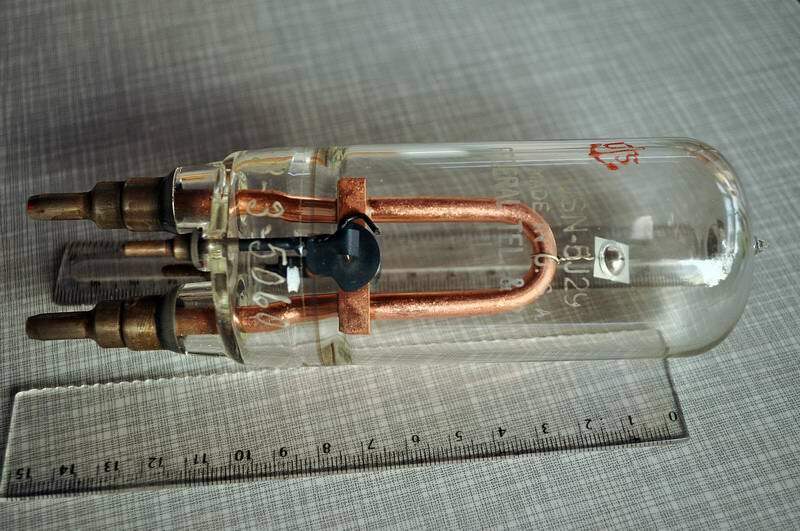 The 5J29 is an unusual device, a water-cooled split anode magnetron, used primarily in the AN/APT-4 radar jammer. 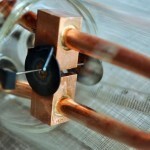 Unlike a conventional multicavity magnetron, the 5J29 is effectively a miniature cyclotron accelerator. The 5J29 is best known as a GE product; the second-source FTR version is much rarer. 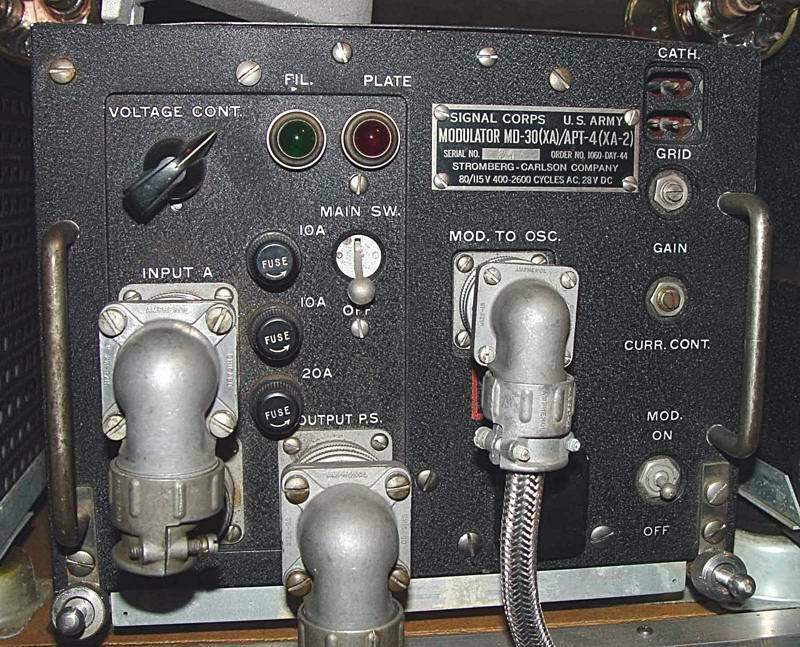 The 5J29 operates at frequencies between 350 and 770MHz. 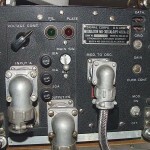 “This jammer, code named Broadloom I, was the first to use one of the techniques feverishly explored in the middle of the war to raise power outputs at VHF and UHF frequencies. 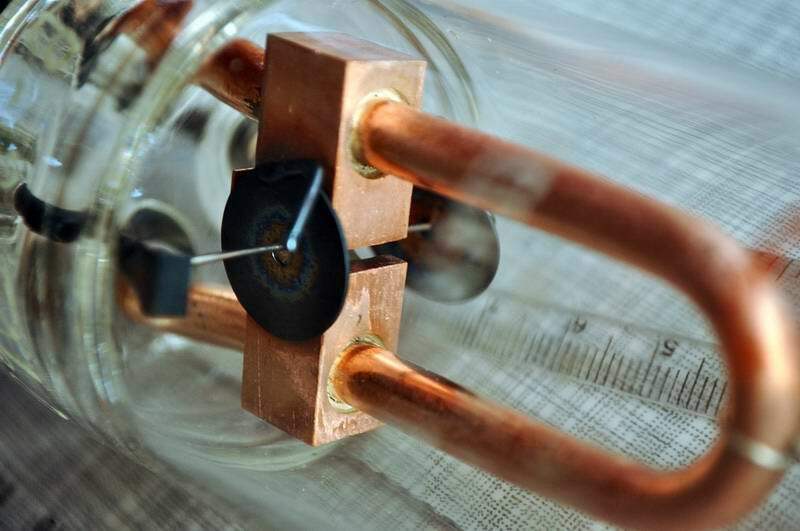 Faced with the inability to use conventional triodes and tetrodes at power levels of more than 20 or 30 watts output, this transmitter was designed to use an early 1930s development – a split anode magnetron – to obtain 150W CW output from about 140 MHz to almost 800 MHz. They used two different tubes to cover this frequency range , along with an impressive amount of hardware devoted to the care and feeding of this simple(!) 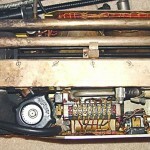 one tube transmitter. 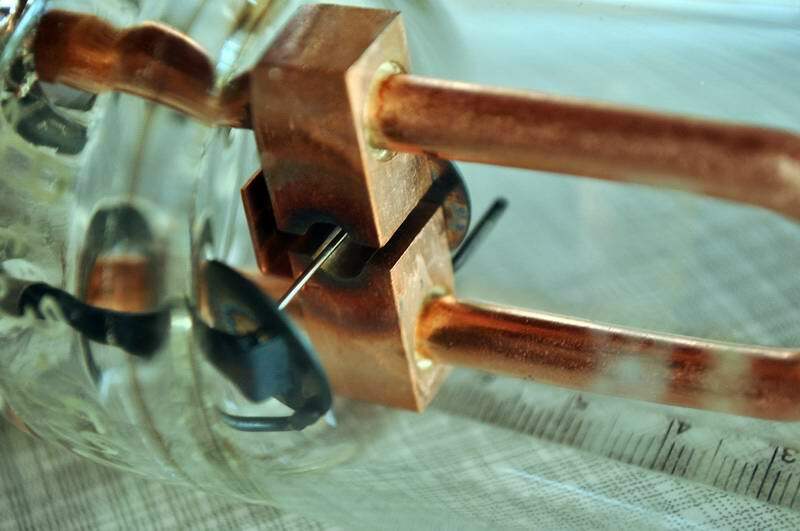 These tubes differed from the more familiar cavity magnetrons used for pulse radar work in that they used an external resonant LC circuit, sometimes called a tank, to provide an impressive tuning range. 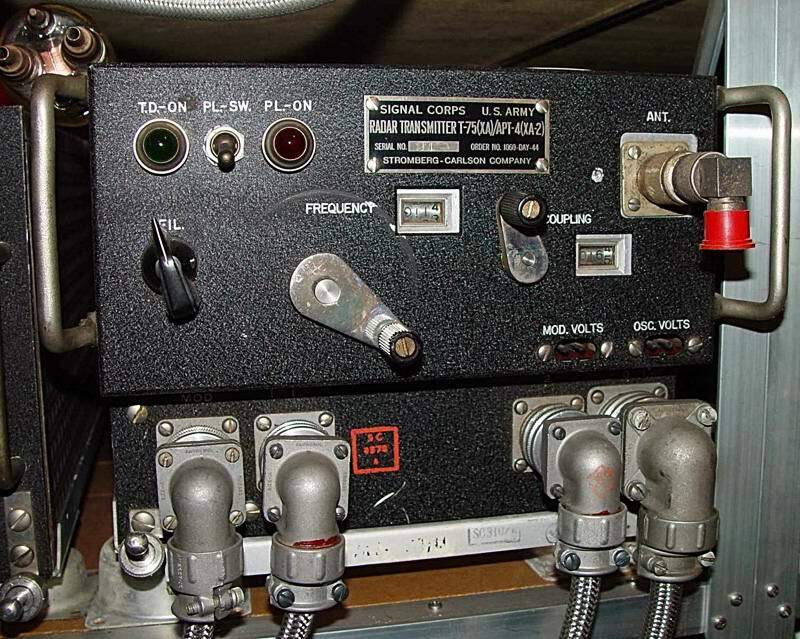 Composed of three separate packages – left to right a power supply, an AM modulator using a pair of 813 PA tubes, and the transmitter – this prototype set by Stromberg Carlson had a production run of only 100 sets. 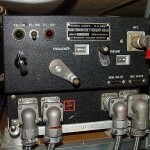 GE was selected to manufacture the final product, and there are small changes between this rare example and the later GE set that had an initial production of 2,092 sets. 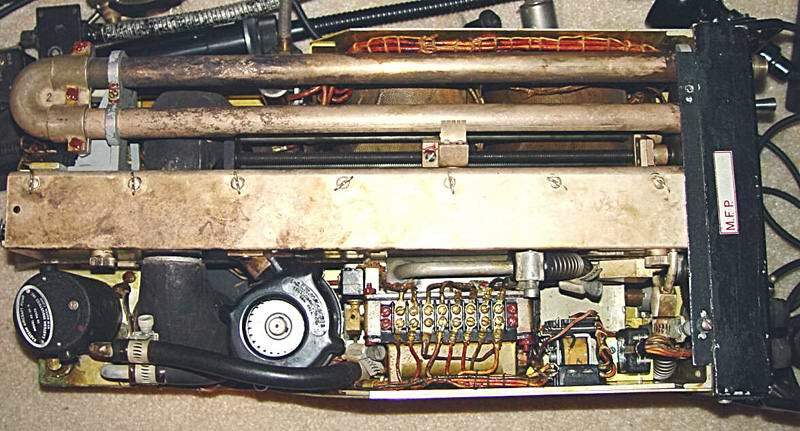 Below is a photo of the interior of the GE transmitter, showing the long tuning cavity and coaxial line stretcher “trombone” used to get the frequency down to its surprising low end of 2 meters.